Today Tuva lost one of the most vivid representatives of the traditional school of Tuvan khoomei, the owner of inimitable performance mastery of kargyraa style, National khoomeizhi of Republic Tyva, Aldyn-ool Sevek. In the words of musicologist Valentina Suzukei, his manner of throat singing was unique to such an extent that it was unmistakably recognizable, just like Soruktu Kyrgys, Ak-ool Kara-Sal, Maxim Dakpai, Kyzyl-ool Sanchy, Khunashtar-ool Oorzhak, Gennady Tumat and many of our prominent khoomeizhis. He was the only khoomeizhi whose performance so far nobody in the world could copy or imitate, despite all striving. A huge kurgan wit a diameter of more than 100 meters, where, possibly, the very same people are resting who raised Arzhaan-2 - that is the so-called elite funerary-memorial complex Chinge-Tei I. South-Siberian archeological expedition headed by Konstantin Vladimirovich Chugunov has been occupied with study of this historical monument already for three years. This year, 25 scientists have been working on excavations of this monument. So far, only a small proportion of the work has been finished. In three years, a small part on the edge of the kurgan has been dug up, it is still far from the center, and to excavate that, technology has to be brought in. Financing of the project, performed by the State hermitage is not that large, and the work moves only slowly. However, the scientists are glad: nobody hurries them, and it is possible to study the object in scrupulous detail. There is plenty to study. 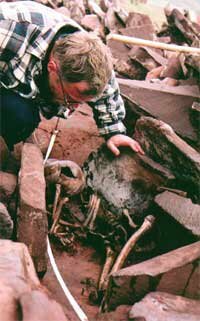 The kurgan is interesting both by its structure and by the finds. Chugunov himself speaks of the results of his studies willingly, even though he does not consider them to be something special. One of the most vivid representatives of the traditional school of Tuvan khoomei, who is the possessor of inimitable mastery of performance in the kargyraa style, is the National khoomeizhi of Republic Tyva Aldyn-ool Sevek. His way of throat-singing performance is unique to such an extent that it is unmistakably recognizable, just as Soruktu Kyrgys, Ak-ool Kara-Sal, Maxim Dakpai, Kyzyl-ool Sanchy, Khunashtar-ool Oorzhak, Gennady Tumat, as well as many others among our prominent khoomeizhis were unmistakably recognizable. The it was impossible to mistake the performance of each of these khoomeizhis with that of anybody else. 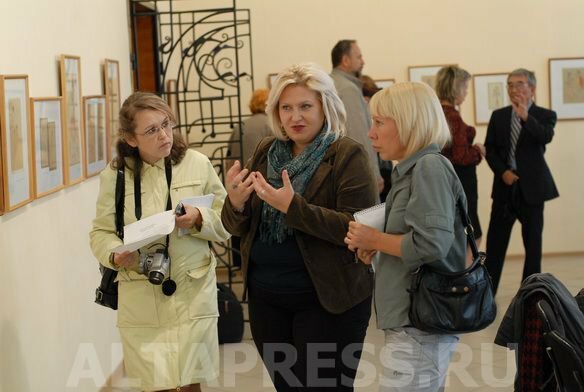 At the State District Art Museum, an exhibition "The World of Nadia Rusheva's graphics" opened on 31 August. The exhibition consists of 68 graphic works from the collection of Aldan Maadyr National Museum of Republic Tyva. The girl genius did not live a full 17 years (1952-1969). They used to call her "Pushkin in drawing".